Hamilton - It is with profound sorrow that we announce the death of Nicholas Davis-Laspesa. 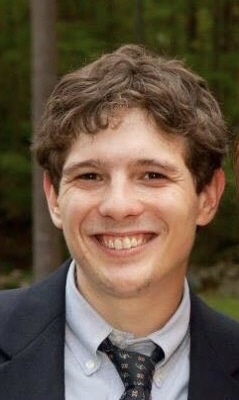 Nick died unexpectedly at his home in Hamilton, MA on March 30, 2019 at the age of 30. Nick was a witty, charming, intelligent and handsome young man who will be sorely missed by his family and friends. He is survived by his parents, Marcia E. Davis and Lawrence A. Laspesa of Hamilton, his brother, Stephen D Laspesa of Manchester by-the-sea, his sister and brother-in-law, Suzanne and John Addison of Beverly. He also leaves his niece and nephew, Morgan and Trevor Laspesa of Manchester-by-the-sea. In addition he leaves his aunts and uncles, Theresa Laspesa, Cynthia and Robert Sbaschnig, Christopher and Antonia Davis, Timothy Davis, Russell and Jennifer Davis, Lisa Davis and Ahva and Shiva Manjunath. Nick also had many loved cousins. He was predeceased by his uncle, Geoffrey Davis, his aunts, Kathleen Laspesa and Christine Kelly as well as his grandparents, Russell and Mary Davis, and Lawrence and Claire Laspesa. We will be celebrating Nick's life on Saturday, June 1, 2019 at the Amaral Bailey American Legion Post #113, 14 Church Street , Manchester-by-the sea, from 2pm-6pm . Online condolences at www.campbellfuneral.com. To send flowers or a remembrance gift to the family of Nicholas Davis-Laspesa, please visit our Tribute Store. Guaranteed delivery before Nicholas's memorial begins. "Email Address" would like to share the life celebration of Nicholas Davis-Laspesa. Click on the "link" to go to share a favorite memory or leave a condolence message for the family.